This past weekend our campus ministry hosted its annual Fall Camp held at Mount Lebanon Baptist Camp in Cedar Hill, TX. We had the largest turnout of students ever held at our fall semester camp that we've been hosting for the last 10 years! 140 students showed up to build relationships, grow closer to God, and be a part of what God is doing at UT Dallas. Group of our UT Dallas and Richland students socializing in the main chapel during Fall Camp! You should see what is going on over here at UT Dallas! I meet students every week that I could only be meeting thanks to your support and prayers. It is really an honor to know that there are men and women out there who are committed to seeing lives changed on his college campuses through prayer and financial support. Every Monday night a group of our student leaders meet at my house to eat dinner and share how our ministries are going. This is one of the most valuable times of my week! Tonight we had a great discussion on small group leading that really challenged and shaped the guys in our Monday night group (see picture above). There are so many students in our ministry with different spiritual backgrounds and stories - it is such a testament to the holy spirit that we can all come together and unite in Christ. These small group leaders are the foundation and rock of our ministry; these are the guys who are on the front lines meeting students on campus and inviting them to be a part of what we believe regarding campus ministry: making and maturing disciples. Please pray that these students would be united and would work together helpfully and humbly as they impact the students in their core. It is very important that we are united as student leaders. Satan will try to divide and attack us but if we remain strong in Christ we will be fruitful. This year is moving fast and I pray that God would reveal to me areas he is working in and I also pray that I would be obedient to what/who he is calling me to. Thank you again for your support - if it wasn't for you none of this would be possible. Thanks for the update Sirak. 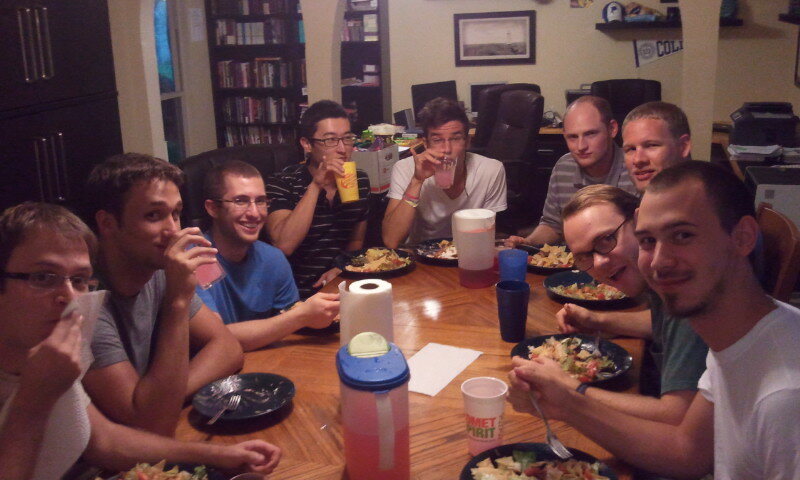 That is an awesome group of young men that meets on Monday. I pray for the cores 7:15am-9:45am in the comet cafe every weekday morning, that God would give wisdom to the corefas, and that they would be an example to their cores in word and testimony as they go out in their studies, their personal walk, evangelism, time management, and teaching. Love ya Sirak.